On Tuesday night I texted a lovely friend I hadn't seen in a few weeks who I owed a phone call to apologise for my rubbishness in the phoning department. She messaged back with the comment that she had been just about to phone me on the off chance I was free to meet up the next day. Since we live at least three hours drive away from each other we agreed a mid point would be good, and since she was dog sitting for a friend I suggested that the Seven Sisters Country Park would be an ideal venue for our catch up. 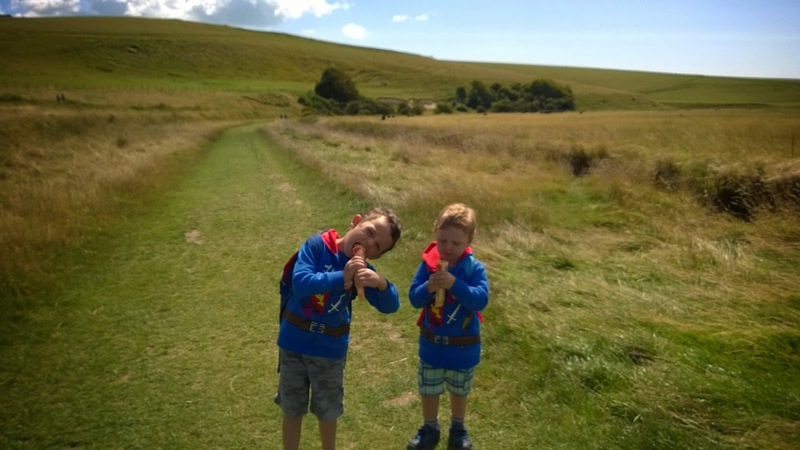 So on Wednesday the boys and I packed up our lunches and headed off to the far reaches of the county to a park threaded through by the meandering Cuckmere river, which is featured in just about every geography textbook I have ever seen (and since I taught geography A Levels for four years that's quite a few). There are many things I love about this park. Getting there takes a bit of a long time from where we live, but it is on a bus route should you need it, and if not the parking in the forest car park is £3.50 for the whole day, which is refreshingly cheap since we went right in the middle of the Summer holidays when everywhere else jacks up its parking charges. There are good facilities near the forest car park, including a tea room, toilets, bike hire and a discovery centre. 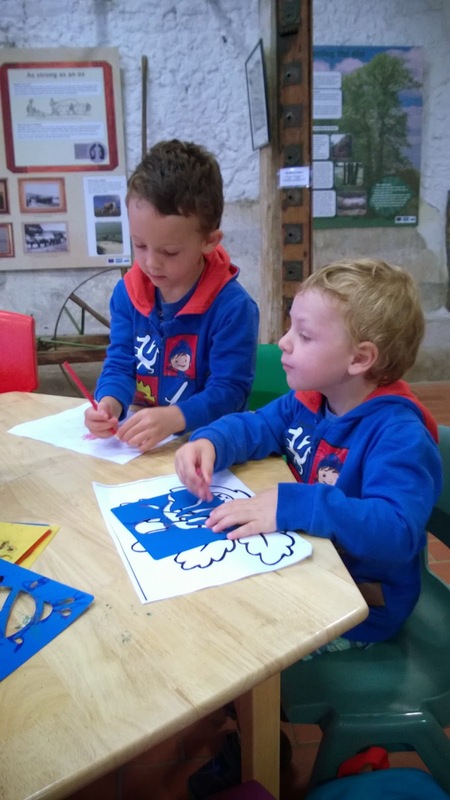 The boys loved the discovery centre, stencilling sea creatures and investigating the hands on display materials of locally found objects. 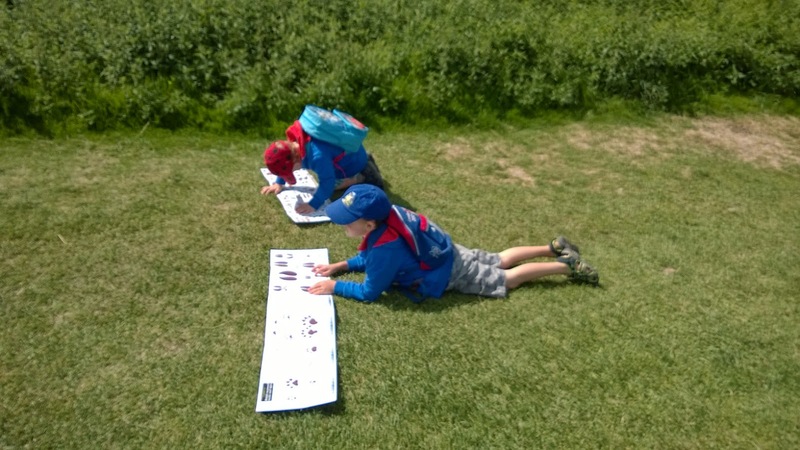 They both had a great experience holding a variety of materials including fossil bearing chalk rocks, whelk egg cases, mermaids purses and a selection of skulls. We looked at the differences and similarities between species of deer skulls and antlers, a sheep skull and even a badger skull. 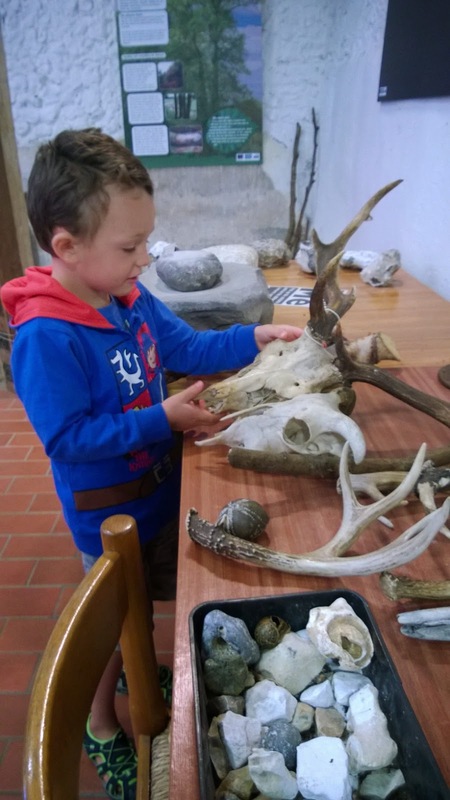 Ollie was fascinated articulating the jaw hinge of the badger skull and seeing how the antlers attached to the deer skulls. Toby understood immediately what the antlers were, holding them up to his head (although his deer noise and cow noise are suspiciously similar). We indulged in a couple of new Field Studies Council fold out identification guides to add to our collection. These provided a great deal of interest as Toby would point to something and say 'what that' and Ollie supplied the name of the object, plant or animal. Ollie liked the poo identification page on the back of his animal tracks guide. An ice cream van supplied us with unsurprisingly overpriced ice lollies which kept us all busy while we waited for my friend to arrive. We also spent the time watching blue butterflies flit around the wild flowers and crouching to peer into the drainage channel near the river, spotting a leech. When I explained what leeches were and how they sucked out animal's blood, Ollie exclaimed loudly 'well I don't want one of those bloody things on me' just as a shocked-looking elderly couple walked past us. Oops. 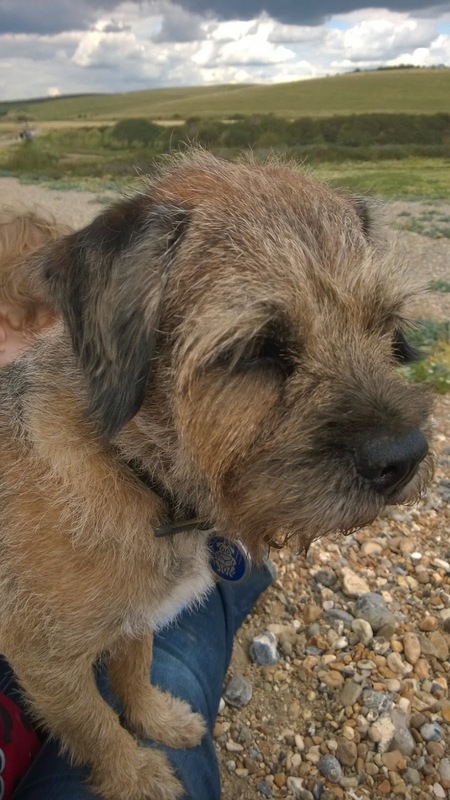 After my friend arrived we enjoyed a stroll down to the sea (slightly hampered by Toby trying to insist I carry him and Ollie wheedling to hold one of the dog leads, while said doggies pulled in different directions). We did manage to get our catch up chat in between 'Ollie get down from there', 'Mila stop pulling', 'CARRY ME!!!' and extracting Toby from the thick back mud in a puddle which sucked his shoe right off his foot. At the end of the walk we sat on the shingle bank overlooking the park on one side and the sea on the other, with the spectacular chalk cliffs to the side of us. I think the shingle might have been hard for less ample behinds than mine because I ended up with both dogs and Toby cuddled up on my legs. If you want a great day out with plenty of opportunities to experience and learn about landscapes and natural history, the Seven Sisters is a great choice. It's never lonely due to the high footfall of visitors, which is handy if you are taking small children out on your own. On this visit I was able to supply a sticky plaster to another family, but if it had been us in difficulties there were plenty of people to help us out too. It is also fairly flat and is accessible for wheelchairs and pushchairs up until you get to the shingle beach at the end of the walk. Even the huge rainstorm brewing in the black clouds waited until we were safely back in the car before it unleashed a deluge, so all in all a pretty perfect day out.